Diogenes of Sinope was an ancient Greek philosopher and self-proclaimed "Citizen of the World" who, at different points, allegedly lived in a wine barrel (or possibly another kind of jar), urinated on guests at a banquet, and made a regular practice of insulting famous figures and lecturing shoppers in the marketplace. Plato reportedly called him “a Socrates gone mad,” while 21st century historians have compared his life to “one long Monty Python sketch.” But, though some believed him to be crazy, Diogenes was also one of the most respected and beloved philosophers of the 4th century BCE, and one of the founders of the ancient Greek school of philosophy known as Cynicism. It’s important to note, from the outset, that there is a huge amount of historical speculation about Diogenes: The philosopher left behind no first-hand accounts of his own life (or if he did, they’ve since been lost), and his larger-than-life persona has likely inspired plenty of apocryphal tales over the last 2500 or so years. Nevertheless, the legend and legacy of Diogenes, as much as the actual person, have played an essential role in the evolution of philosophy as a discipline. Often said to have been born in 412 BCE in Sinope, now a city in Turkey, Diogenes seems to have had an unremarkable childhood. His father worked with money—perhaps as a banker or minter. As a young man, Diogenes began working with his father, but before long, the pair had a life-changing brush with the law: For reasons now lost to time, Diogenes (or possibly his father, or possibly both of them) began defacing money. While some historians believe their motivations were political, others think the defaced coins may have been the result of an incident involving the Oracle of Delphi. Either way, Diogenes soon skipped town—perhaps because he was exiled, or because he fled before he could be tried for his crimes. Diogenes began building upon the moral and political theories of Antisthenes, eventually developing a lived philosophy that was inspired by, but distinct from, his mentor’s. That philosophy, which embraced poverty and rejected the material and cultural trappings of Greek life, came to be known as Cynicism. But the Cynicism of Diogenes was more than an ascetic movement. Diogenes didn’t just renounce possessions—he promoted obscenity, broke taboos, and was relentlessly and proudly rude. For Diogenes, honesty was a key value, and he saw Athenian conventions and manners as a form of lie. He was said to walk the streets holding up a candle or lantern and shining it into the faces of passersby, claiming to be looking for “an honest man” or a “human being” [PDF]. The philosopher wielded absurdity and wit like weapons, using them to question conventions, and to make fun of the aristocrats, intellectuals, and philosophers of his time. On another occasion, a group of wealthy Athenians at a banquet began throwing bones at Diogenes, calling him a dog. Diogenes responded by lifting his leg and urinating on the banqueters. 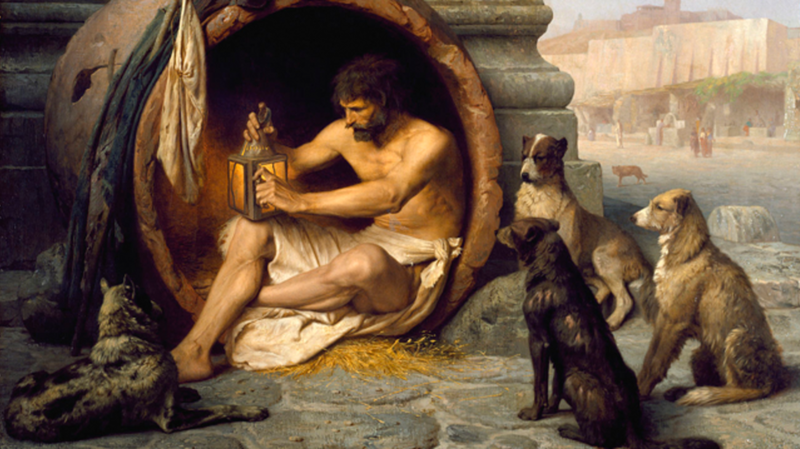 In fact, Diogenes was often associated with dogs. He once explained, “I fawn upon those who give me anything, and bark at those who give me nothing, and bite the rogues.” The word Cynic itself is related to the Greek word for dog, though it’s unclear whether Cynicism is named for Diogenes’s affinity for the animal, or for his teacher’s academy, which was called “The Temple of The White Dog." After years of torturing the intellectual elite of Athens (many of whom, it should be noted, actually loved his entertaining antics), Diogenes ended up in Corinth. To be more specific, he was captured by pirates during a voyage to Aegina and sold to a wealthy Corinthian named Xeniades. When asked if he had any skills, Diogenes replied, “That of governing men.” Xeniades instated Diogenes as the tutor for his sons, and eventually Diogenes became like a member of the family (whether he was ever officially freed is a matter of debate, though it’s clear he was allowed to do what he wanted). Diogenes lived in Corinth for the rest of his days, where he continued to promote his philosophy and live a life of poverty. He is believed to have passed away in 323 BCE at the age of 90, though like much of his life, the cause of his death is a source of debate. Some believe the philosopher was bitten by a dog, others that he ate a bit of bad octopus, and still others that he held his breath until he died. Most historians, however, believe he likely died of old age-related ailments. Though Diogenes had requested his remains be thrown to the dogs, his friends and fans insisted he receive a proper burial. His friends placed a marble pillar and a statue of a dog above his grave.